Using your green waste recycling bin is another great way to help complete the organics loop. This loop starts when grass, leaves, flowers, and other yard materials are discarded into this bin (no pumpkins please!). These materials are collected and chipped into mulch, which is then distributed to local residents and farmers. Mulch Program Coordinator Joey Costa says, “The main benefit of mulching is water conservation and nutrient input. Returning this mulch to the soil completes the organics loop, with many positive impacts for any garden.” Residents can get “load your own” mulch for free at the South Coast Recycling and Transfer Station and the Santa Ynez Valley Recycling and Transfer Station. For details, visit www.LessIsMore.org/Mulch or call (805) 681-4981 in South County or (805) 686-5084 in North County. For more information about the Backyard Composting Program and composing at home, visit the County’s recycling website, www.LessIsMore.org/Compost or call (805) 882-3618. Maybe Santa Barbara could have a yearly pumpkin collection, as is done with Xmas trees. I don't see why the pumpkins can't be added to City and County composting facilities. As for the pumpkins being "too wet," that's just silly. Nothing is wetter than Oxalis pes-caprae (aka "Sourgrass") added to one's green waste, especially if the sourgrass weeds have been yanked out after a rain. my compost bin is barely big enough for all of the produce scraps, eggshells, and coffee grounds that my family produces on a weekly basis already. It's a two-sider, and we always have to switch sides again back to the first side before it has fully composted. Probably should get a second one. SANTA BARBARA NEEDS CURBSIDE COMPOSTING! It is in so many communities ALL OVER THE COUNTRY AND BEYOND- yet the “birthplace of Earth Day “ can’t seem to make it happen in their own city. The time is NOW. Too many of us can’t compost in our own yard for various, legitimate reasons. Curbside compost must happen now! Oh my, I've been tossing them in my green waste pick-up for many years - oops!! "This loop starts when grass, leaves, flowers, and other yard materials are discarded into this bin (no pumpkins please!). " i think it would be wise for Santa Barbara to add compost bins to their recycle program. many communities do. I was unaware that pumpkins could not go in green can. Not everyone has a yard for a compost pile. community compost bins is a great idea! It's okay to throw in the street if it's your own pumpkin. One year my jack 'o lanterns were smashed in the street by ? ?, not cool. If you live in an apartment do what the article said, put in yard waste bin for the city to pick up. For homes with yards, break up and bury in the yard if it won't fit your compost bin. 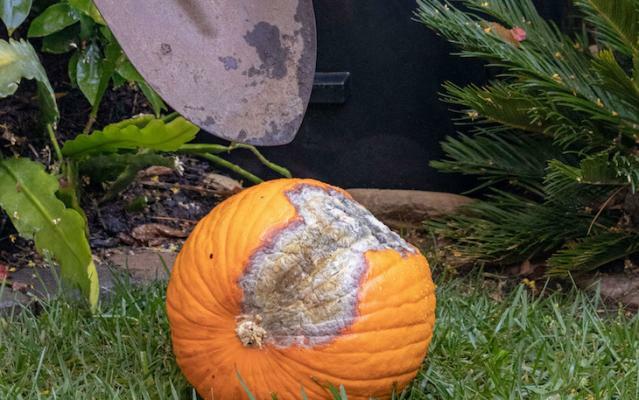 NO pumpkins in green cans for yard waste! They're too wet. YETI. You crack me up! Please compost, but don't use the green waste? Not 100% helpful. Are there any public compost bins? We have a compost bin, but it's not big enough for our pumpkin. And, if you live in an apartment? Is throwing them in the street ok? That is a lot more fun and they can still compost.